I'd like to introduce you to Craig Saunders, and his latest release, Left to Darkness. If you haven't read his work before, you're missing out. A meteor strikes the Earth. Dirt and dust fill the air. Only a few people remain under the setting skies, and those who still live find it's not God's England anymore. To survive, they must put their lives in one man's hands: Frank Liebowicz, a killer with a soft spot for lost causes. Because come Armageddon, God won't choose his champions. Craig Saunders is the author of over thirty novels and novellas, first published with 'Rain' in 2011. Stories include 'Flesh and Coin', 'The Estate', 'Deadlift' and 'Masters of Blood and Bone', called 'A rare treat from a master of horror' by The Examiner. He writes dark fiction/horror with an element of crime or mystery, and epic fantasy. His shorter fiction appears in various anthologies and magazines. Sometimes he dabbles with humour - but only when he's feeling serious. Born in 1972 in London, England, Craig did some stuff (like growing up - abridged version), then studied Japanese and Law in Cardiff, Wales. After deciding the legal side of the law wasn't much fun, he left British shores to live and work in Japan. He has experimented with jobs as diverse as a translator and interpreter, English teacher, editor, dog walker, carpenter, doorman, and others besides. 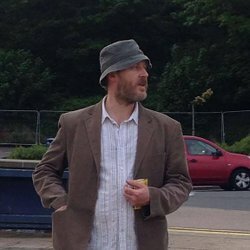 He lives in Norfolk, England, with his wife and children, likes nice people and good coffee. 'Saunders is fast becoming a must read author in the realms of horror and dark fiction.' - Scream. [Bloodeye] '...razor-sharp prose.' Wayne Simmons, author of Flu and Plastic Jesus. [A Home by the Sea] 'Brutal and poetic, like good horror fiction should be...' - Bill Hussey, author of Through a Glass, Darkly. [The Estate] 'A tale that you are unlikely to forget in a long time.' DLS Reviews. [Rain] 'I'd say it's the best book I've read in a year.' - The Horror Zine. [The Estate] 'A horror novel full of emotion and heart.' - Ginger Nuts of Horror.